The FLEXiO® 890 stationary painting system puts the weight in the integrated storage case on the ground for extended spraying comfort. It can paint a wall 12 times faster than a brush or put a fine finish on furniture saving time and effort. 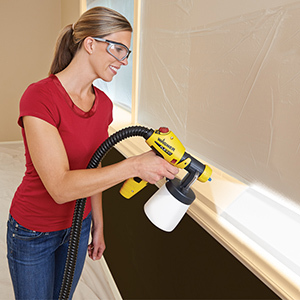 The FLEXiO 890 paint sprayer comes complete with two nozzles, one for big surface projects like walls and ceilings and the other for small projects and fine finishing on furniture, cabinets and trim. The turbine sits on the ground delivering air power through the hose to spray unthinned coatings with on-handle adjustments to maximize coverage and minimize overspray. Flexio 890 Sprayer is rated 4.3 out of 5 by 24. Rated 5 out of 5 by Brett from Very valuable tool I purchased this to paint some 100 year old doors that had so many brush strokes from previous applications that the doors looked terrible. I sanded the old finish smooth with 120 grit sandpaper and then cleaned with a damp cloth. I sprayed the doors with a semi-gloss latex paint and was absolutely stunned by what I accomplished in about 10 minutes. I did apply a second coat but the doors looked almost new and yet all the original hardware still fit and so we can tell they are old doors. I have since used the tool to paint kitchen cabinets and furniture. You will not be disappointed. Clean up takes a little longer than they say it will but I found that starting with a clean tool means cleaning up properly when done. Don't shortcut the process. I have used the product for over one year without any issues. Rated 1 out of 5 by MerchMar from Great product if lasts enough to finish the projec Easy to use, and easy to clean. I am very disappointed as unit stopped and never worked again when I moved to backyard to continue the fence job. This was my second time using it and unfortunately passed the warranty period. 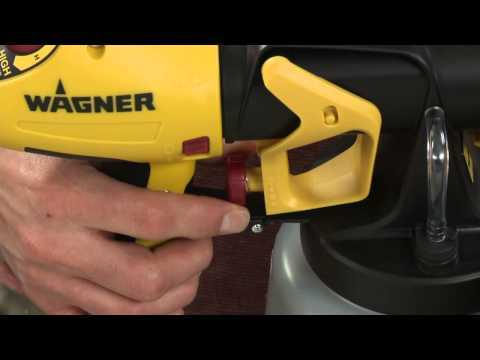 Rated 5 out of 5 by Warms Fuzzy from Great homeowner's tool! Opened it up, set it to recommended settings for my latex primer/paint, and had fun painting my house. All four times it misbehaved were user error. The first was severe drooling and glob-spitting because I didn't realize the black keeper ring came a bit loose when I changed my spray pattern. That ring needs to stay as tight as it goes; I don't think you can overtighten it by hand. Second time, I failed to unscrew the container before taking off the black keeper ring, and air pressure made it barf paint. Third time was glob-spitting, and I was stumped for a while; I thought I had done everything by the book. Figured out the teeny air valve had water in it from the last washing; when dried, worked perfectly again. Fourth time, same spitting, but because the little air hole in the top of the suction tube got paint on it-- I had knocked over the sprayer's container after adding paint. I detail those because the short trouble-shooting section in the booklet didn't give the last two as "how to fix" options. Some reviews said they took the nozzle apart and soaked it if they took a break, but you don't need to. 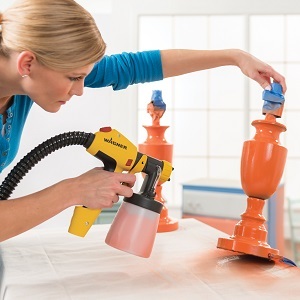 The air channel and paint channel are separate, so leave the nozzle all together and the paint won't dry anywhere but the exposed tip of the nozzle, which is super easy to wipe clean even when the paint is dry on it; the plastic resists paint cling. My one gripe is mild: so that the larger material container can hold as much as it does, it has a rim angle that means it has to be turned absolutely upside-down when pouring paint out. There was always at least a quarter inch left in the bottom that the suction tube couldn't get. I am a female with size 8 hands and can barely hold the bottom of the material container with one hand, so the whole paint-retrieval process is slightly annoying. As for cleaning, I tried the recommended process of spraying water through before taking apart the nozzle, but prefered to just take it to the sink instead; the latex paint needs more than a rinse to come off because it's so thick. I carried this rig in pieces up and down a two-story scaffold many times, slightly awkward but very doable. The reach of the hose isn't great if you're using this on a ladder, but any longer and it would get annoying to deal with; it is fairly stiff. I appreciated that I could turn the compressor on and off from the hand unit. The switch is on both sides of the handle, so it's easy to toggle no matter which hand it's in. The compressor's just quiet enough that I didn't need hearing protection (outdoors), and I am sound sensitive. I'm glad I went for a model with the separate, ground-based turbine, and glad it has its own handled case. And yes, the spray gun holder on that handle is helpful, especially if you are working on uneven ground where the hand unit would fall over by itself. Thank you, Wagner people, for making this handy little machine! Rated 2 out of 5 by Macer from Loss of power I have had this gun for less than a year and now it wont power up. I flip the switch and nothing happens. Rated 5 out of 5 by katethepainter from Ease of use makes this a must have for all DIYers My husband and I own a small boutique that specializes in Repurposing old furniture. I bought my Flexio 890 last summer and since that time have used it to paint over 250 pieces of furniture. Prior to that I was painting all of our pieces with a brush. This product has been a lifesaver and a huge Timesaver. It also gives an incredibly perfect finish to our pieces that could not be achieved with a brush. The biggest compliment from our clientele is that the pieces we do have such a perfect finish...no brushstrokes...no drips. I was a bit reluctant at first, to use the sprayer thinking there would be paint everywhere. The paint gets on the piece but there is almost no overspray. I was also concerned that after a few uses, it would clog up and that the clean up would take more time than painting with a sprayer would be worth. Not true. The cleanup is very easy and after 250 pieces, it still works perfect every time. I use mine almost everyday and I don't know now how I ever lived without it. No classes required. Fill it with paint and get to work. Your first piece will look like it was painted by a pro. Rated 5 out of 5 by JDOM37 from Lifesaver!! I recently used the Flexio 890 to paint my 1950's interior walls and was blown away by how fast and effective this tool is. It is quiet and works with ease. It is easy to set up and cleanup. The Flexio 890 has been a lifesaver. I really do not like to paint, but with this by my side I feel like I don't have to spend a whole day doing something I do not enjoy. This is a must buy if you paint a lot! So worth it! 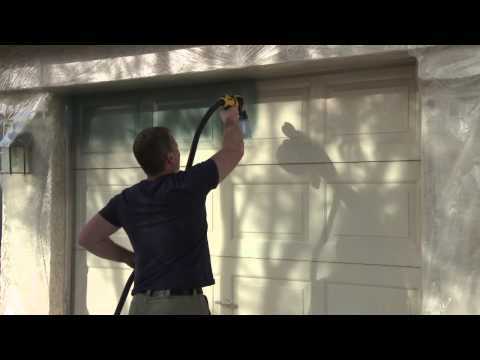 Rated 2 out of 5 by hotdaddy1 from Not for an indoor space painting a Quick review for Wagner 890 airless paint spray. Survived from suffocation today. I bought a Wagner airless paint sprayer to save time and energy for paining our new house. However, it turned out that a paint sprayer was not a good idea for painting an indoor space especially about 12X13 size rooms. 1. the room was filled with the paint dusts (I don't know how I call it but the sprayed paint particles) in couple minutes. And with just a 3M dust mask, I couldn't breath properly. So I stopped painting and bought a $60 3M mask to resume (And I realized it was another mistake and money wasting in couple minutes though). 2. In couple minutes later, the dusts covered my safety glass and blocked my sights so that I couldn't even tell how much paint I put on the wall. And the outcome turned out horrible. Luckily a SW paint shop was close by my house so that I could bought rollers and trays and fixed the issue before it all dried. However, I wouldn't recommend using paint sprayer for indoor space paining. I still don't understand how come the reviews on the Wagner site are all 5 stars. Rated 4 out of 5 by trswendt from Makes painting projects much easier Painting projects usually go to the bottom of my to-do list because they are tedious and time-consuming. 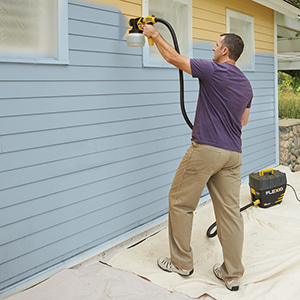 The Flexio 890 made painting quick and even fun. The whole system is contained in a small, but sturdy case; making i teasy to tote to the project site and easy to store. The motor is relatively quiet compared to other sprayers. The sprayer is very light; my arm didn’t get tired holding it. Coverage was great. I used a paint & primer combination so it saved me a lot of time. There are adjustments to control the direction, width, and intensity of the paint. I was pleasantly surprised that clean-up was pretty easy. The spray head pops apart, and the material it’s made of allows the paint to wash off pretty easily. The bench rocker in my backyard went from junk to fab. My front door went from green to red in less than an hour. Can't wait to tackle the rest of the projects on my list. I just bought the Flexio 890. I have never used a paint gun before and I'm wondering if I will need an air compressor for this? If so, what CFM is required? This is a self contained spray system, no outside parts are required. Why would my sprayer be continuously spraying with the trigger not engaged? &nbsp;And it draws paint into the blower tube. The sprayer should not spray without the trigger being pulled. Give us a call at 1-800-328-8251 and we will assist you with the issue. What is the difference between the Flexio 890 and the Flexio 4000? Do they have the same pump and sprayers? Either better than the other? The Flexio 890 is the old version iSpray front end and the Flexio 5000 is the new version iSpray front end. The Flexio 690 is the old version iSpray and the 4000 is the new version iSpray front end. The performance is essentially the same with all four systems. The physical setup is slightly different. The 690/4000 has a 16' air hose and no storage, the 890/5000 has 11' of air hose and a hard shell case for storage. For more help call us at 800-328-8251. Do you sell a 20&rsquo; hose for the Flexio 890? Sorry no, we do not offer a longer hose for the Flexio 890. For further help give us a call at 800-328-8251. Thanks for your inquiry! 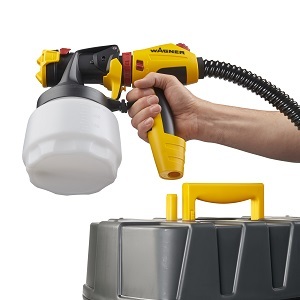 I just purchased a FLEXiO 890 and was wondering if the Gen 2 p/n 0520006 spray gun for the FLEXiO 5000 will fit my existing hose? 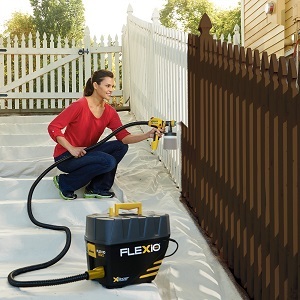 Can the 890 draw direct from paint container (1 gallon or 5 gallon)? how much does the 890 weigh in hand? 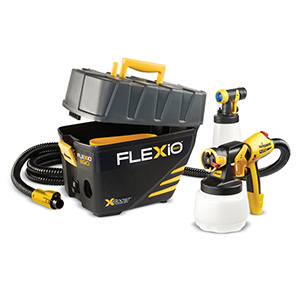 The Flexio 890 with the iSpray front end, without paint in the container, weighs about 3 lbs. The detail finish nozzle, without paint in the container, weighs about 2 lbs. For more detailed answers call us at 800-328-8251. How to unclog my spray tips? The front end of the 890 is removable. Separate it from the gun handle and break it down into individual parts in the sink. Rinse each part until clean, reassemble the sprayer and load with water to test and make sure it is clean and clear. To prevent clogs you can thin the paint slightly, strain the paint, stir the paint with a mixer in a drill or add a flow agent (Floetrol). For more tips call us at 800-328-8251.